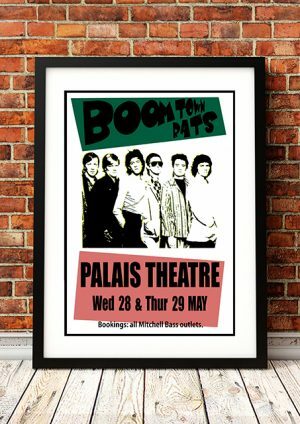 Classic Boomtown Rats Band Concert Posters and Memorabilia! Buy Online Now! The Boomtown Rats were an Irish rock band that scored a series of British hits between 1977 and 1980, and were led by singer Bob Geldof, who organized the Ethiopian relief efforts Band Aid and Live Aid. The Rats were formed in Dun Laoghaire, near Dublin, Ireland, in 1975 by Geldof . They took their name from Woody Guthrie’s novel Bound for Glory. The group moved to London in October 1976, and became associated with the punk rock movement. Signing to Ensign Records, they released their debut single, “Lookin’ After No. 1,” in August 1977. It was the first of nine straight singles to make the U.K. Top 40. In the fall, “Rat Trap” from the album hit number one. A Tonic for the Troops was released in the U.S. on Columbia Records in February 1979 with two tracks from The Boomtown Rats substituted for tracks on the U.K. version. 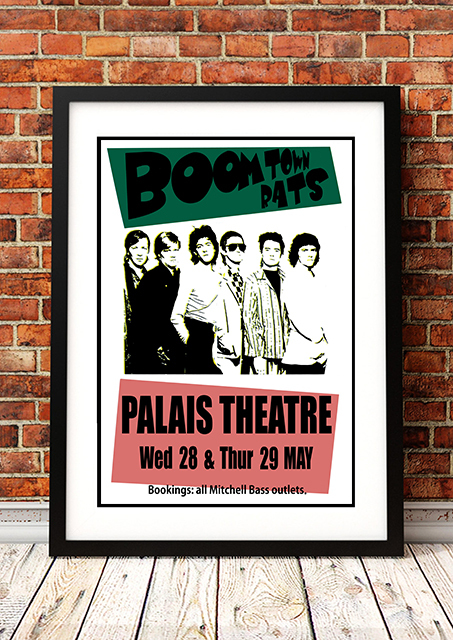 We stock some awesome Boomtown Rats Band Concert Posters.